Email marketing is a great way to keep in touch with your audience, and help drive engagement and sales. Since marketing is building and maintaining a relationship with your audience, email plays a huge role in the overall interaction you have with your readers. 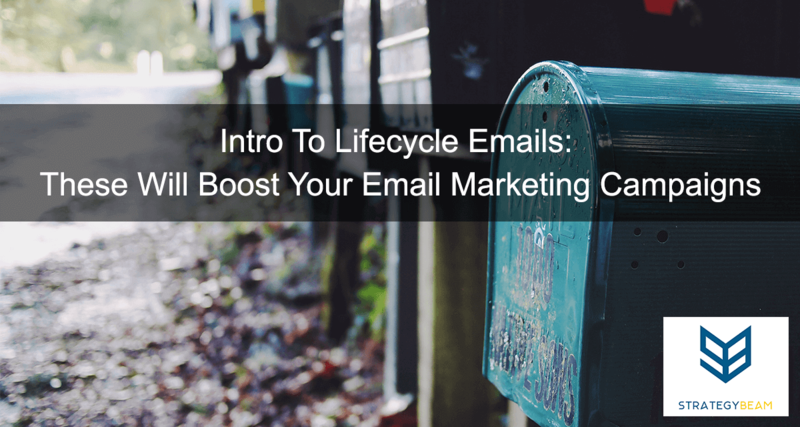 The lifecycle of this relationship comes in several distinct phases, and it is beneficial to understand the five main types of email marketing along that lifecycle. Let’s take a look at some ways to optimize your email marketing campaign to increase conversions and drive sales! Onboarding emails are usually the first category of emails your audience will receive from you. As a set of automated messages, the purpose of these emails is to educate, set expectations, and begin to establish the relationship with the recipient. The main reason for onboarding emails is to help acquaint your customer with you. This will help with retention, and that is a problem because getting a new client is about 5x as expensive as keeping one. 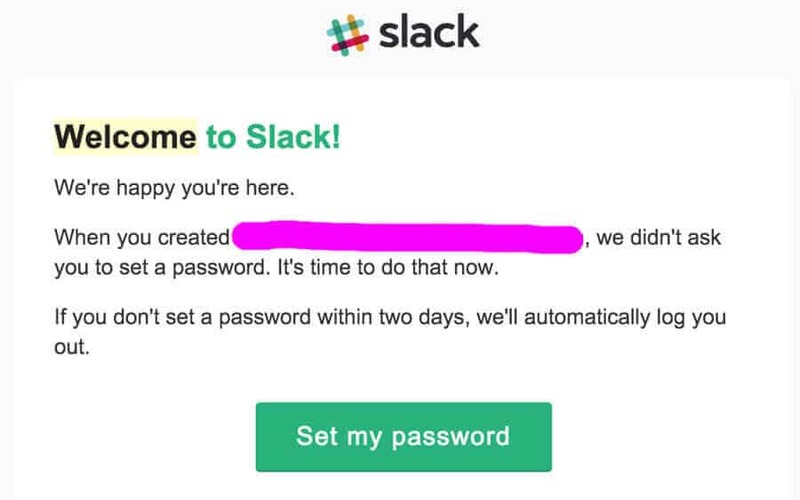 Slack does a great job with the first onboarding email I received from them. They kept it quick and to the point, and focused the CTA on setting my password. Since onboarding emails are the first interaction, you will have with your audience, be sure to use a tone and messaging that is consistent with your brand. If you are a hard-rock band, you don’t want to have pink kittens in your tone or images. Customer emails tend to be the second category of emails you will send your audience; These are sent on a semi-frequent basis (if your audience agreed) about content that is meaningful and relevant to them. 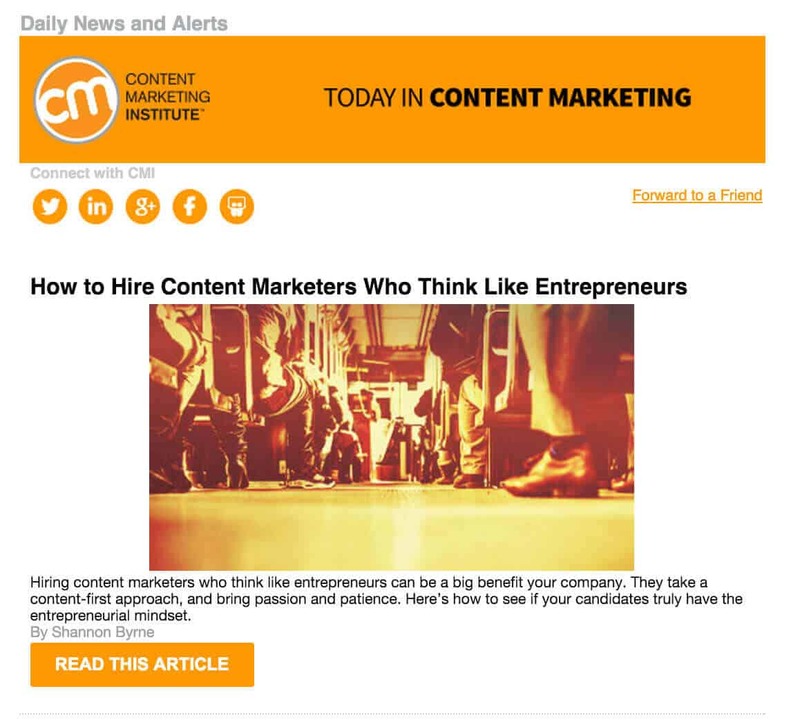 CMI does one of the best jobs out there of sending relevant, timely content through their subscriber email campaigns. This is highly segmented information, so receiving the emails on a daily basis doesn’t bother me. Subscriber emails are usually the “bread and butter” of your email campaign. This is where you can build your authority and keep the top of mind with your audience. This is also a great place to do a lot of A/B testing to see what kind of content work, and encourage your audience to fill out their user profiles to help you understand their demographic and wants/needs better. 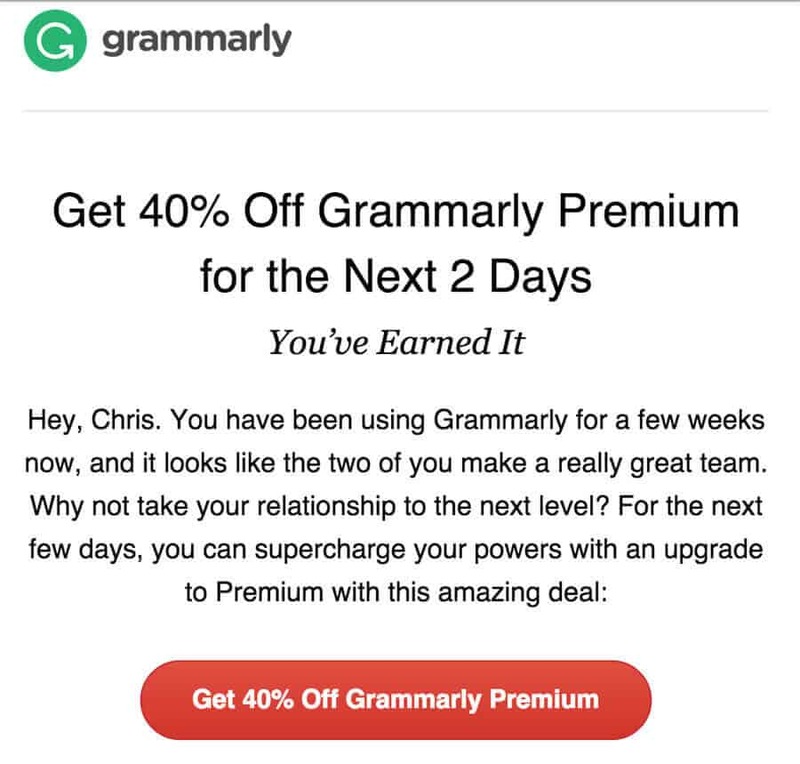 Grammarly does a great job with their promotional emails. Urgency and benefits, plus a clear CTA for action. Promotional emails should not be the bulk of your email marketing strategy. If you send too many of these, you are keeping the conversation focused squarely on purchasing and commerce. In many cases, even if you are a commerce-focused business you want to concentrate the majority of your emails to be subscriber emails. Promotional emails should be highly segmented, and have a clear Call To Action that gets results. These should be short and sweet, and focused on the product, circumstance, or offering. When using promotional emails, be sure to track everything with UTM Parameter Codes. This will allow you to make better decisions in the future for your promotional emails, and you will be able to apply what you learn to your other email campaigns. 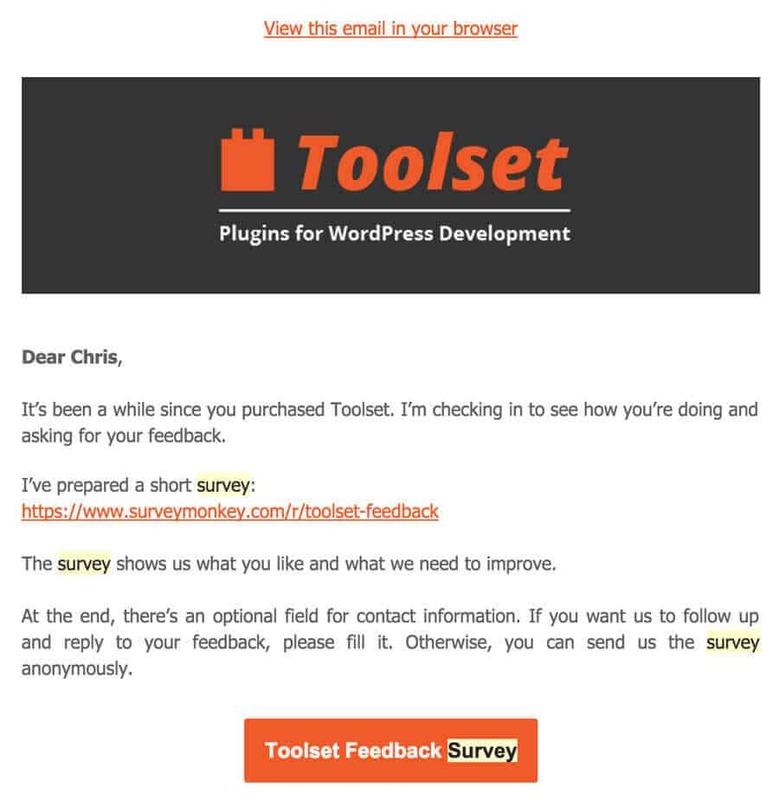 The toolset is a WordPress plugin, and their team does a great job sending out surveys frequently to keep their product offering on par with customer demands. Behavioral emails are an advanced group of emails, and should only be implemented if your business has a strong content strategy in place. This type of email requires you to map out your content to a very granular level, and will need a lot of time, energy, and resources upfront. However, once your business can set up behavioral emails on the backend, the payoff can be enormous. Be sure to track and test behavioral emails throughout the entire campaign. I recommend setting up simple behavioral email campaigns based on three of your user personas at the beginning. This will allow you to focus on your customer needs, and not get bogged down with too much technical stuff or options. An excellent example of a Forgot Password email. Short, sweet, and to the point. Provide the natural link for password recovery, and additional information if needed. Your audience only receives transactional emails when they need them. These kinds of emails should be short, sweet, and to the point. I would not recommend linking other content, and just give them the information they need. Now it’s your turn! What emails have you used to engage your audience? Let me know in the comments below!